Step into the world of medieval Prague with a stroll across pedestrian-friendly Charles Bridge. Completed in 1402, the bridge replaced an older structure and became a major commercial link between eastern and western Europe. For nearly four centuries, this Gothic structure was also the only connection between the city's old town and the growing residential neighborhoods on the other side of the Vltava River. The bridge rests on 16 arches and spans 621 m (2,037 ft), featuring a continuous alley of 30 statues depicting saints venerated at the turn of the 18th century, when they became the structure's main decorative elements. Plan to visit Charles Bridge and other customer-reviewed, writer-recommended Prague attractions using our Prague visit planning app . Crowded and cramped. Should be seen early in the morning or in the evening. Good restaurants against Castle, but go a bit from the stream of people. So famous by its name and surrounding is beautiful with colourful house at the bank of river. Nice place to take photos especially late afternoon in summer. Nights are also nice and very lively. However bit cautious of the traffics on road just beside it. Here people drive car crazy and no respect to pedestrians. And road is uneven and that makes difficult if you are with kids stroller. Seen some really good talented musicians there which are unique. One of the most lovely places in all Prague, this place is full of street artists trying to do all stuffs! Dancing, singing, playing music, drawing, painting, and so much more! The tourists are everywhere so it might be a little bit noisy, I suggest to come early in the morning to enjoy some cool air. The view is very good and if you enjoy reading up the history of the bridge, you can see the significance of it and in my opinion, it will make you enjoy more of the bridge itself. Loved this place because of the vibe and the awesomest live music. There were three different bands at a single point in time. Definitely visit in the evening, though it's jam packed. Don't be a typical tourist. Stay a couple of hours and enjoy the evening with music. For better shots stay longer for the blue hour! One of the most picturesque bridge in the old town of Prague. Its more spectacular during sunrise and sunset. The statues on the Bridge add to its glory. It's the top tourists flocking place, therefore always overcrowded. There is also a tower standing on each end of the bridge.The view of the city, from the Charles Bridge is amazing. Not to be missed when in Prague. Praha is proper place to go around by walk. And I didn't realize it was Charles Bridge as I walked on this bridge. It is very fabulous to see around Praha from this bridge at day or night. However, please be noted that how much famous it is, they are many people over there and this bridge is not big and long to stay. So no time to enjoy the history or beauty of this place. Every day, we help thousands of travelers plan great vacations. Here are some tips on how to use your Listing Page to attract more travelers to your business - Charles Bridge. Promote your permanent link - https://www.inspirock.com/czech-republic/prague/charles-bridge-a210457335 - on your website, your blog, and social media. 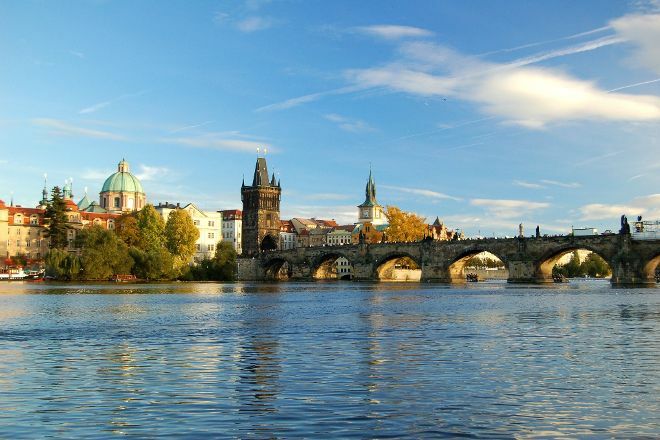 When a traveler builds a plan from this page, the itinerary automatically includes Charles Bridge. This is a great way for travelers looking for a great vacation in your city or country to also experience Charles Bridge. Promoting your link also lets your audience know that you are featured on a rapidly growing travel site. In addition, the more this page is used, the more we will promote Charles Bridge to other Inspirock users. For best results, use the customized Trip Planning Widget for Charles Bridge on your website. It has all the advantages mentioned above, plus users to your site can conveniently access it directly on your site. Visitors to your site will appreciate you offering them help with planning their vacation. Setting this up takes just a few minutes - Click here for instructions.